In this exercise, students predict changes in the movement of a dissolved plume in response to remedial pumping in an unconfined aquifer. The underlying conceptual model for the distribution of aquifer and aquitard materials is not known with certainty. 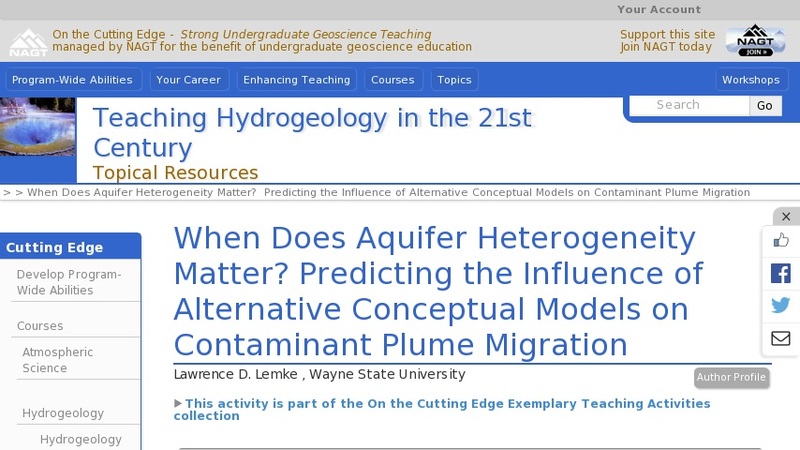 Consequently, two alternative end-member conceptualizations are presented to students who are then asked to hypothesize differences in predicted responses at the pumping wells and nearby monitoring wells for each conceptual model. Predictions are compared to actual field data, and students discover that contaminant concentration measurements depend not only on the location of the observation point (in three dimensions), but also on the length of the screened interval through which water samples are collected. The activity is divided into three parts: (1) site/problem description, (2) formulation and testing of hypotheses for pumping wells, and (3) formulation and testing of hypotheses for monitoring wells. The activity gives students practice in three dimensional thinking and reinforces their intuitive understanding of contaminant plume migration in response to natural gradients and engineered stresses.